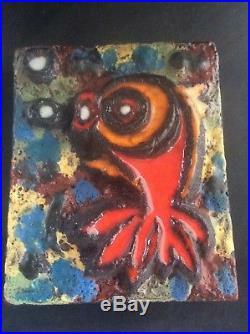 Ruscha Keramik Fat Lava Pottery Fish Wall Plaque Vintage Mid Century Modernist. 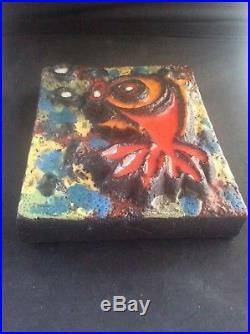 This is a Fab piece of West German Art Pottery - it is about as good as it gets. It measures 7.35 inches x 6.5 inches x 1.5 inches and was made in Western Germany in the 1960s. The item "Ruscha Keramik Fat Lava Pottery Fish Wall Plaque Vintage Mid Century Modernist" is in sale since Wednesday, October 25, 2017. 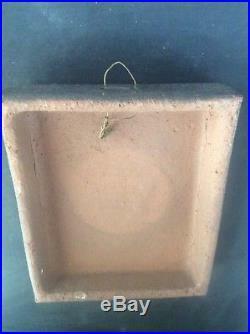 This item is in the category "Pottery, Porcelain & Glass\Date-Lined Ceramics\1960s/ 1970s". The seller is "quirkyvintageandbooks" and is located in YORKSHIRE. This item can be shipped to United Kingdom, Antigua and barbuda, Austria, Belgium, Bulgaria, Croatia, Cyprus, Czech republic, Denmark, Estonia, Finland, France, Germany, Greece, Hungary, Ireland, Italy, Latvia, Lithuania, Luxembourg, Malta, Netherlands, Poland, Portugal, Romania, Slovakia, Slovenia, Spain, Sweden, Australia, United States, Russian federation, Canada, Brazil, Japan, New Zealand, China, Israel, Hong Kong, Norway, Indonesia, Malaysia, Mexico, Singapore, South Korea, Switzerland, Taiwan, Thailand, Bangladesh, Belize, Bermuda, Bolivia, Barbados, Brunei darussalam, Cayman islands, Dominica, Ecuador, Egypt, Guernsey, Gibraltar, Guadeloupe, Grenada, French guiana, Iceland, Jersey, Jordan, Cambodia, Saint kitts and nevis, Saint lucia, Liechtenstein, Sri lanka, Macao, Monaco, Maldives, Montserrat, Martinique, Nicaragua, Oman, Pakistan, Peru, Paraguay, Reunion, Turks and caicos islands, Aruba, Saudi arabia, South africa, United arab emirates, Ukraine, Chile.